In an unintended consequence of Israel's offensive in Gaza last month, sales of Palestinian olive oil in Britain are soaring, importers have said. The devastating conflict, in which 1,300 Palestinians were killed, has prompted a surge in demand for the product in apparent sympathy for the Palestinians. Equal Exchange, a seller of Fairtrade products, reported a threefold increase in sales of olive oil from the West Bank in January compared with a year ago. "We have run out of one-litre bottles and we expect sales to double to 400 tonnes this year compared to 2008," said Barry Murdoch, the sales director of Equal Exchange. The company Zaytoun, also established to sell Palestinian olive oil in the UK, reported a fourfold rise in sales last month instead of the usual post-Christmas lull. 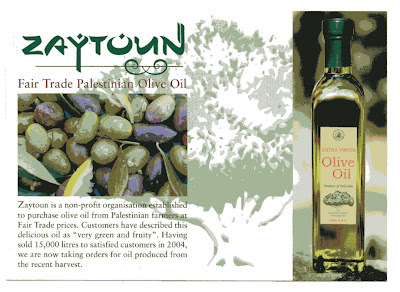 Zaytoun, established by two Britons, Heather Masoud and Cathi Pawson, takes its name from the Arabic word for olive. The surprise sales increases coincide with a publicity drive for Palestinian products during Fairtrade fortnight, which runs from 23 February to 8 March. Nasser Abufarha, the chairman of the Palestinian Fairtrade Association, is touring the UK to support the launch of the world's first Fairtrade Palestinian olive oil. Winning Fairtrade certification is an important breakthrough for Palestinian oil producers, as they will now have access to mainstream British supermarkets such as Co-op, which has been working closely with Equal Exchange to get Palestinian products on to the shelves. Fairtrade also means better prices for olive growers. "We have been working for the Fairtrade certificate for four years," said Abufarha, who has campaigned against the building of Israel's security barrier. "Fairtrade will increase our sales, and bring us new markets and widen our reach." The farmers were sceptical at first, Aburarha said, as they could not imagine why anyone would pay them above the market price, but they were willing to give it a try. And the certification was about more than price, he said. "We have given farmers hope. An economic exchange that recognises Palestinian farmers' rights and respects the value of their connection to their land, after marginalisation under Israeli occupation, is a major accomplishment." Olives are the most cultivated tree crop for Palestinian farmers, and more than 100,000 people work in the industry. But farmers face severe difficulties because of the security situation. Orchards have been bulldozed in the course of the conflict, and to make way for new settlements. The village of Anin, west of Jenin in the West Bank, has seen 1,100 hectares of olive orchards cut off by Israel's security fence. Permits from the Israeli authorities are difficult to obtain and there are severe time constraints for visits, making it so hard for farmers to tend to their trees that some have given up altogether. The Palestinian Fair Trade Association is attempting to work with farmers in nine cooperatives – about 2-400 farmers in each – to develop fair trade practices. Aburaha says some of them have processes that stand comparison with the best Italy has to offer. Palestinian Fairtrade olive oil is not cheap, with one litre of extra virgin oil from Equal Exchange retailing at £14.99; one litre of olive oil from Puglia can be found for as little as £6. But Zaytoun and Equal Exchange believe consumers will be willing to pay premium prices for the Fairtrade label. In recent years, Fairtrade products such as tea and coffee have seen strong growth in sales, although this may change with the increasing severity of the economic downturn. In terms of taste, Palestinian olive oil is a hit with foodies. The River Café is so impressed with Zaytoun olive oil that it wants to try other Zaytoun products, from olives to almonds. And the food and wine writer Malcom Gluck described Zaytoun as "one of the least aggressive yet pungently attractive olive oils I have tasted", and ranked it alongside the best of the fruity Sicilian, Cretan and northern Spanish oils.